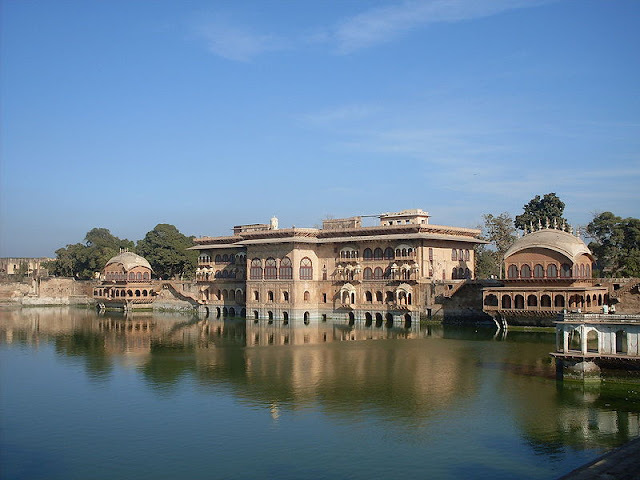 Bharatpur State, also known as Bharatpore State, was a Hindu princely state in India. It was ruled by a Hindu Jat dynasty. The descendants of Khanu Chand became leaders of the Jat caste and rose to considerable power during the Mughal decline in the late seventeenth century. At the end of the 17th century, Jat Baija, Zamindar of the village of Sansani, took advantage of the weakness of the Mughal Empire to enlarge his territory. His descendents, Churaman Singh and Badan Singh, continued the expansion, the latter being the founder of the fortress of Bharatpur in 1724. Badan Singh extended his territories and received enhanced titles and honours. He was succeeded by Suraj Mal, his nephew, stepson, and adopted son, under whom the power of the Jats reached its zenith. Suraj conquered a vast territory in north central India, including the Imperial cities of Agra and Delhi. Thereafter the Jats proved fickle allies, making and breaking alliances with the Mughals, the Mahrattas, and the British, losing territory to all three, but also gaining Deeg in the process. The British, under Gerard Lake, 1st Viscount Lake (Lord Lake), fruitlessly besieged the fort of Bharatpur twice, in 1804 and again in Siege of Bharatpur (1805)during the Second Anglo-Maratha War, eventually settling for a subsidiary alliance after the failure of the second siege. The fort eventually fell to Stapleton Cotton, 1st Viscount Combermere's (Lord Combermere) forces in 1826 in the three weeks Siege of Bharatpur after the British had intervened to unseat a usurper, and was demolished. Thereafter, the Jat Maharajas proved to be good allies to the British, supplying large numbers of recruits for the Presidency armies and participating in Imperial campaigns. 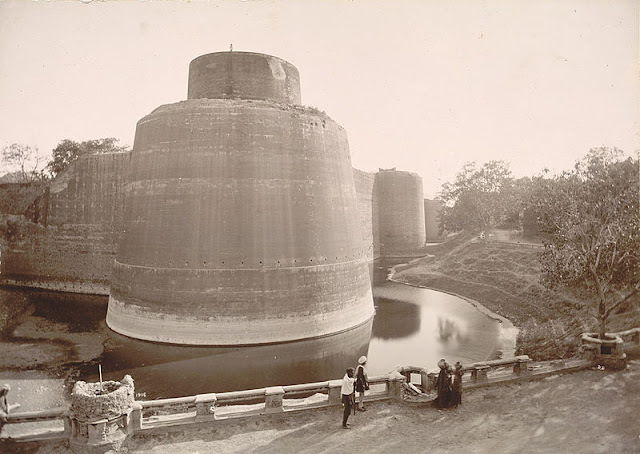 View of the Deeg Fort taken in the 1890s. Deeg was the first capital of the Sinsini Jats established by Badan Singh. Later the capital was moved to Bharatpur. 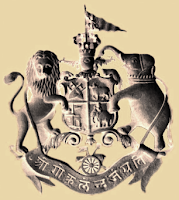 In August 1947 the state acceded to the newly independent Dominion of India. 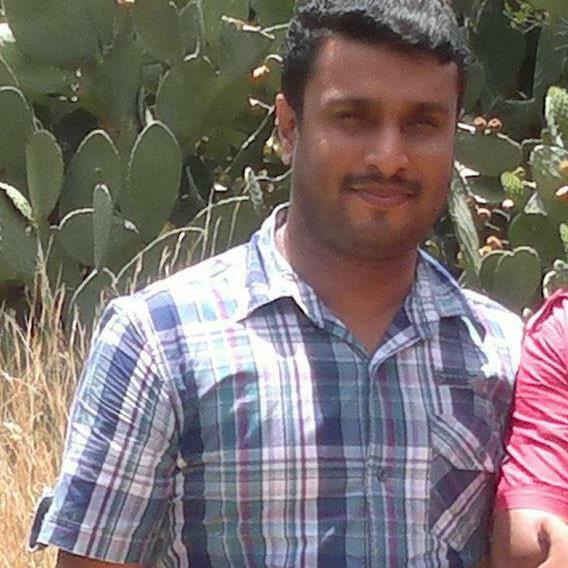 In 1948 in became part of the Matsya Union and in 1949 was absorbed into Rajasthan. Members of the ruling family continue to be active in national and regional affairs. Several members of the family have served as members of parliament and in the state legislature. According to Alexander Cunningham and William Crooke, the city of Gohad was founded by the Jats of Bamraulia village, who had been forced to leave Bamraulia by Raja Nahar Khan, a satrap of Firuz Shah Tughluq. Gohad developed into an important Jat state, and was later captured by the Marathas. The Jat people of Gohad signed a treaty with the British and helped them capture Gwaliorand Gohad from the Marathas. The British kept Gwalior and handed control of Gohad to Jat people in 1804. Gohad was handed over to the Marathas under a revised treaty dated 22 November 1805 between the Marathas and the British. As a compensation for Gohad, the Jat ruler Rana Kirat Singh was given Dhaulpur, Badi and Rajakheda; Kirat Singh moved to Dhaulpur in December 1805. Dholpur was taken by Sikandar Lodhi in 1501, who transferred it to a governor in 1504. In 1527, the Dholpur fort fell to Babur and continued to be ruled by the Mughals until 1707. After the death of the Mughal emperor Aurangzeb, Raja Kalyan Singh Bhadauria obtained possession of Dholpur, and his family retained it until 1761. After that, Dholpur was taken successively by the Jat ruler Maharaja Suraj Mal of Bharatpur; by Mirza Najaf Khan in 1775; by the Scindia ruler of Gwalior in 1782; and finally, by the British East India Company in 1803. It was restored by the British to the Scindias under the Treaty of Surji Anjangaon, but in consequence of new arrangements, was again occupied by the British. In 1806, Dholpur again came under the Jat rulers, when it was handed over to Kirat Singh of Gohad by British as a reward for their loyalty. 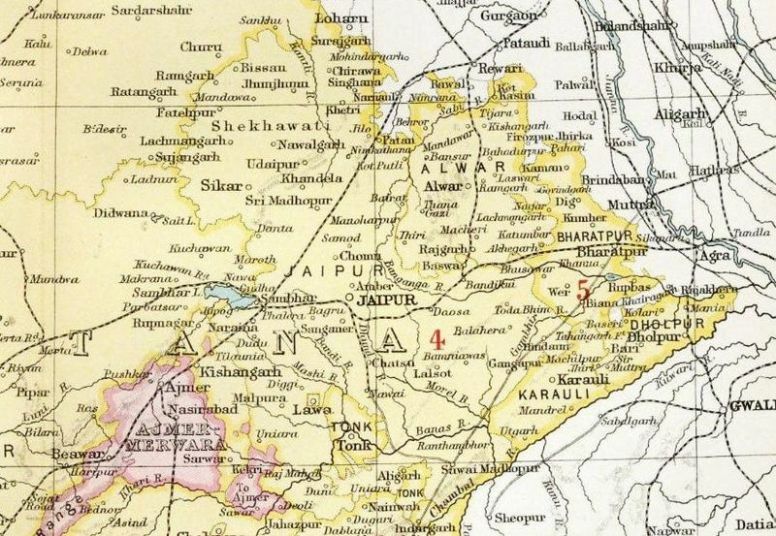 Dholpur thus became a princely state, a vassal of the British during the Raj. Ballabhgarh was another important princely state established by the Jat people of the Tewatia clan, who had come from Janauli village. Balram Singh, the brother-in-law of Maharaja Suraj Mal was the first powerful ruler of Ballabhgarh. Raja Nahar Singh (1823–1858) was another notable king of this princely state. The Jat rulers Maharaja Bhim Singh Rana (1707–1756) and Maharaja Chhatar Singh Rana (1757–1782) occupied the Gwalior Forttwice, Maharaja Bhim Singh Rana from 1740 to 1756, and Maharaja Chhatra Singh Rana from 1780 to 1783. Maharaja Suraj Mal captured the Mughal stronghold Agra Fort on 12 June 1761 and it remained in the possession of Bharatpur rulers till 1774. After Maharaja Suraj Mal, Maharaja Jawahar Singh, Maharaja Ratan Singh and Maharaja Kehri Singh (minor) under resident ship of Maharaja Nawal Singh ruled over Agra Fort. 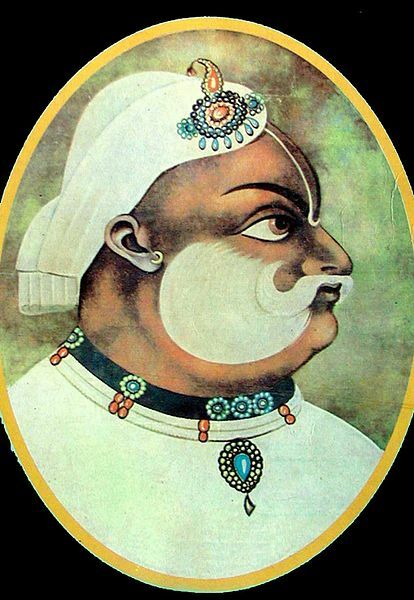 Maharaja Suraj Mal of Bharatpore (1756–1767). 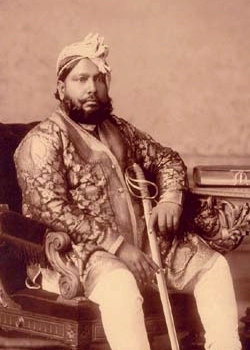 Maharaja Jashwant Singh of Bharatpore (1853–1893).